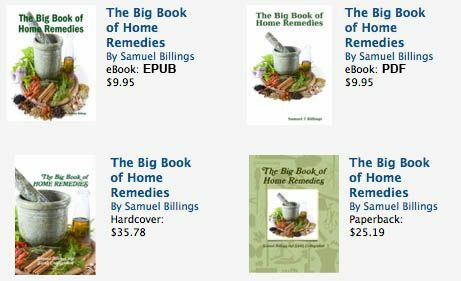 The Big Book of Home Remedies offers from ten to twenty-five different home remedies and natural health treatments each for over one hundred different common health conditions. That’s nearly 2000 different remedies. No matter what health concern you have, you will find a home remedy for it in this book. From acne, acid reflux, bronchitis, depression, eczema, sore throats, sore muscles, PMS, yeast infection, conjunctivitis and so on. This book will save you money from less visits to the doctors, less prescription medicines and that means less side effects too, everything you need is already in the kitchen or garden or if not, soon will be after you get this amazing book. Anybody interested in natural health, holistic healing and home remedies is going to absolutely love The Big Book of Home Remedies! Zip file containing both .PDF and .MOBI files. (Amazon kindles and other ebook readers can read .mobi files.) INCLUDES BONUS to MEMBERS AREA for FREE EBOOKS. Read using Adobe Reader on any computer. Read on any Epub reader device, kindle etc. And if you do decide to buy my ebook, please leave a message somewhere on my website letting me know what you think, and what you think of the bonus too? I am hoping you will find it to be one of the best home remedies resources you have ever come across. Thank you. See Main Sales Page Here!